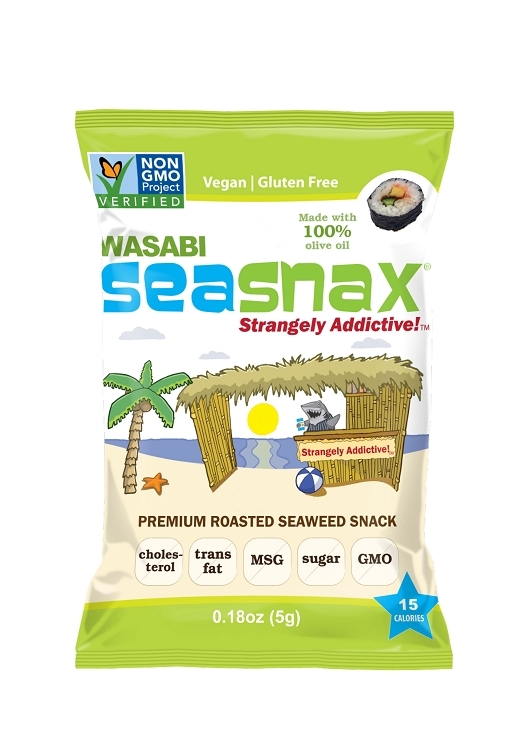 SeaSnax Wasabi is a slightly spicy roasted seaweed snack which is vegan, gluten free, Non-GMO Project Verified and made using organic seaweed, 100% organic extra virgin olive oil, natural wasabi flavor and just a pinch of sea salt – just four all natural ingredients! There are no artificial colors, flavors or preservatives. With 15 calories per serving, SeaSnax is a healthier alternative to chips to satisfy that craving in between meals, and a convenient way to add sea vegetables to a healthy eating lifestyle. Enjoy it with rice, veggies, in soup or salad... or just right out of the bag! The Wasabi Grab & Go 6-Pack includes 6 convenient-sized packs that are ready to be grabbed and thrown into your bag or lunchbox!